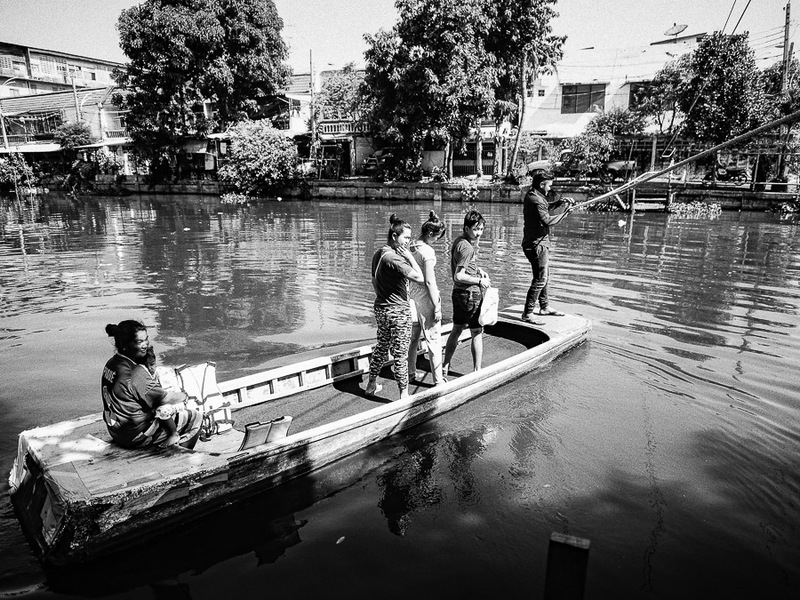 A boatman pulls passengers across Khlong Samrong in Samut Prakan province, a Bangkok suburb. Bangkok used to be known as the "Venice of the East" because of the canals (called khlongs in Thai) that crisscrossed the city. Now the khlongs are filled in and cars have replaced the boats. 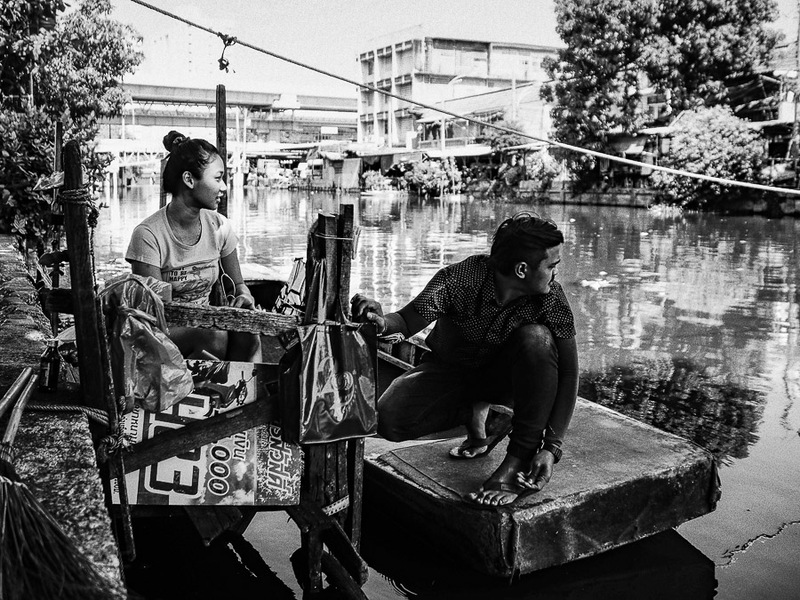 There are still a few parts of Bangkok though that have regular boat service. While the boatman pulls her across. He's 19 years old and has been working the crossing for years. 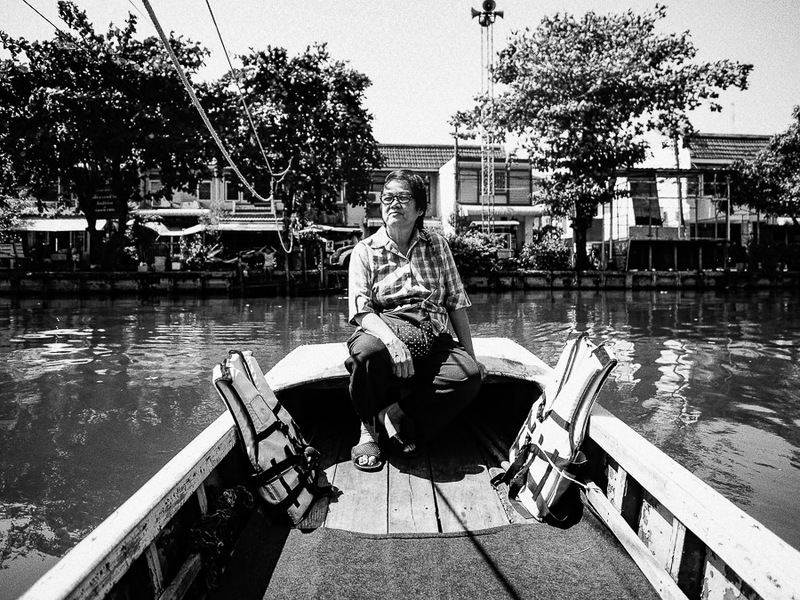 There used to be small "mom and pop" ferry crossings, little more than a dingy pulled across the canal by rope, throughout Bangkok. Most are now gone, replaced by bridges, buses and motorcycles. I found one of the remaining ferries on Khlong Samrong in Samut Prakan province, a suburb of Bangkok. The boatman grew up in the neighborhood and has been working at the ferry since he was a child. He sits in a shady spot and waits for a passengers to show up. 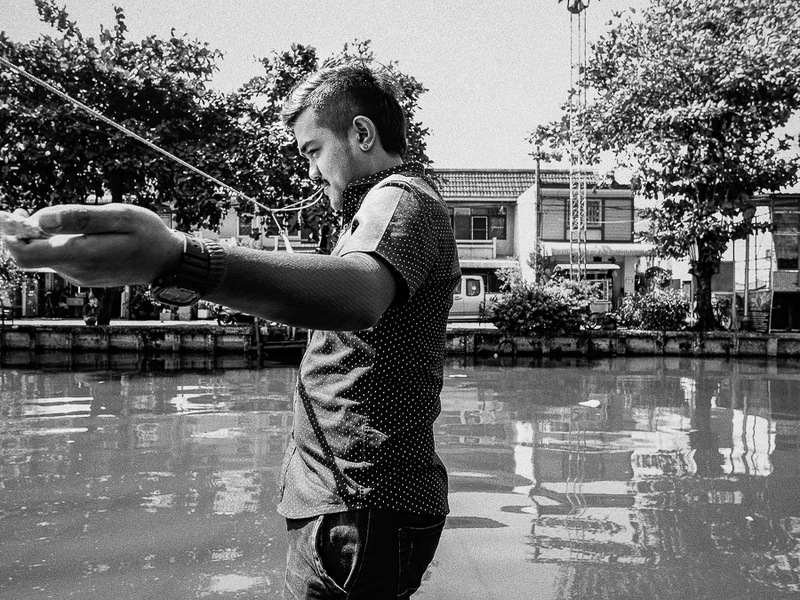 He pulls them across the canal, only about 50 feet wide, for the princely sum of 2Baht (about 0.06¢ US). Taking a passenger across the khlong. There's a foot bridge over the canal about 50 yards up the canal but the little ferry is surprisingly busy. 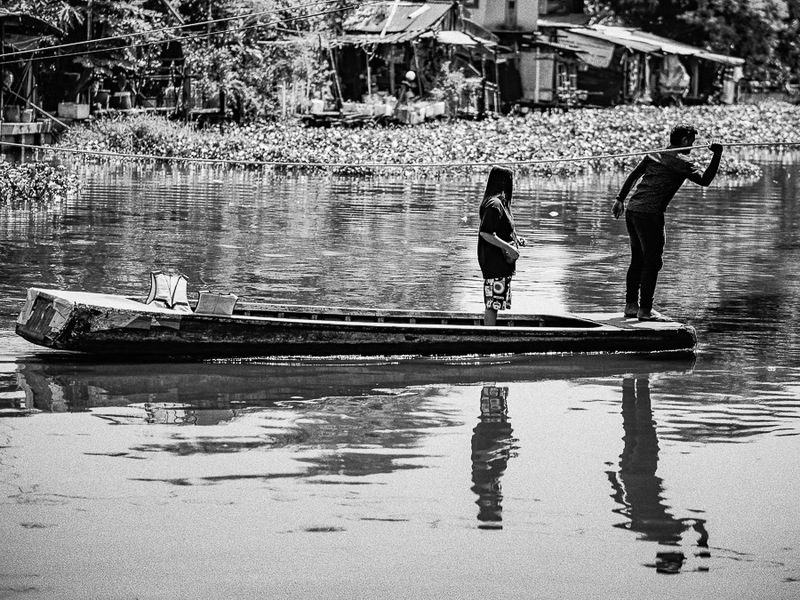 I spent a couple of hours photographing the boatman. I think he made 20 or more crossings in the time I was there. 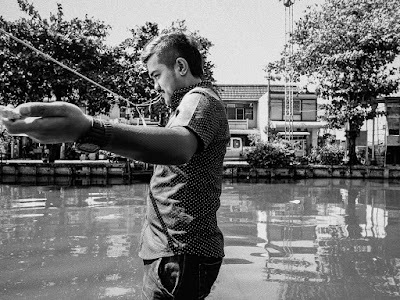 The canal isn't very wide and it only takes a minute or two to get across, when he's not busy pulling people across the khlong, he chats with his girlfriend, who kept him company while I was there, or passersby. Waiting for passengers. Looking up the canal from the ferry you see the Bangkok skyline. There are multiple bridges and a shopping mall within easy walking distance. Looking down the canal is like looking into old Southeast Asia, with houses on stilts (previous photo). 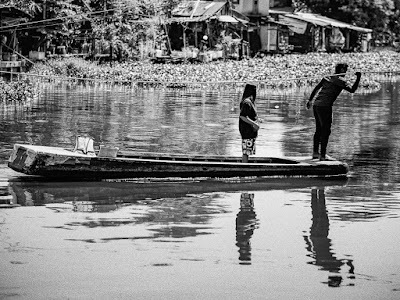 There are more photos of the rope pulled ferry (both black and white and color) in my archive.